There are many theories about the origin of Chinese characters. It is widely believed that Chinese characters originated from pictographs. The earliest known form of Chinese writing is oracle bone script. As the time went on Chinese writing evolved and begun being used in a variety of materials not just in bones, the characters themselves also changed. First came bronze inscriptions, then seal scripts, followed by clerical scripts and finally simplified Chinese, with each change of Chinese characters and the materials they were written in, communication became more convenient and effcient. In the ancient times, people lived by the water and from this picture you can get a glimpse of what life was like at that time. In this picture, you can see a river flow at the foot of mountains and trees grow. On the plains there are sheep on one side of the river and a house and a piece of land on the other. A man sits on the stone grilling his fish over the fire under the bright sun. Have you found all the Chinese characters hidden in this picture? 1.日(rì)refers to the sun. This pictograph resembles the sun and the horizontal line “一”in the middle is said to signify the radiance of the sun or sunspots observed by people in the ancient time. Later the shape of the pictograph changed from a circle to a square and “日” came into being. 2.木(mù) first referred to a tree and now it refers to wood. This pictograph resembles a tree with leaves on the top and roots on the bottom. Later branches became the horizontal line “一” and “木” came into being. “木” is also the radical of many Chinese characters related to tree or things made from wood. 3.人(rén) : This pictograph resembles the profile of a standing person. The upper part represents arms and the lower part, legs and feet. The character “人” having arms and legs emphasizes that we human beings can use tools, a huge difference from animals. Later, “人” is like a person striding forward. 4.山(shān) refers to a mountain. This pictograph is like three mountains connected to each other. It is because in the ancient times the Chinese character “three” also had the meaning of “many” so although this character showed “three” mountains it actually expressed the meaning “many mountains”. 6.火(huǒ) : This pictograph is like the shape of fire when things are burning. The middle part is the flame and two spots are like the spark. So the whole character is just like fire burning. 7.水(shuǐ) : This pictograph is like a ripple. The middle part represents where the water flows and the surrounding part is just like water drops. As the character evolves, the middle part became ”亅” and water drops turned into three strokes and ”水” came into being. 8.家(jiā) : The upper part “宀” is like the roof of a house and ”豕” means pig. A place where people could be sheltered and there were things to eat can be called home, which is “家”. 9.田(tián) refers to square land. This pictograph is like pieces of land where grains grew. “田” was written in different ways in the ancient time, demonstrating the importance ancient society attached to agriculture. 10.羊(yáng): This is a pictograph. 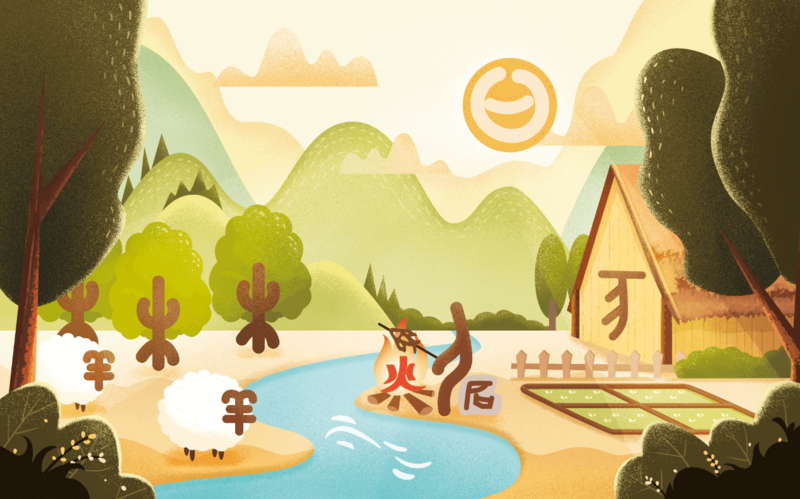 The earliest “羊” was like a male sheep. In the eyes of ancient people, the sheep was the smartest, meekest, and the most wonderful animal. So character “羊” is symmetrical with the meaning of equilibrium. Now the upper part of the character “羊” represents its horns, the first and third horizontal line represent its limbs, and the shorter horizontal line in the middle and the vertical line represent its body. Ancient people created these characters by observing the world around them, which was a demonstration of their ingenuity. After learning more about these characters you can have a better understanding where they came from and how they can be used. click the button to learn more about these words!